Position of Farm Food B.V.
For years, reports have been going around Facebook and all kinds of (primarily American) websites about the harmful production methods used to make dog chews, lumping all dog chews together under the rawhide moniker. Although we consider this to be predominantly scaremongering (with no basis in fact), we certainly understand the potential consumer concerns, which is why we would like to give you some information about the quality of our Farm Food Rawhide. There are many different dog chews available, varying in quality, which are made from hide (commonly referred to as rawhide). Many are made from tanned hide (also known as leather hide). 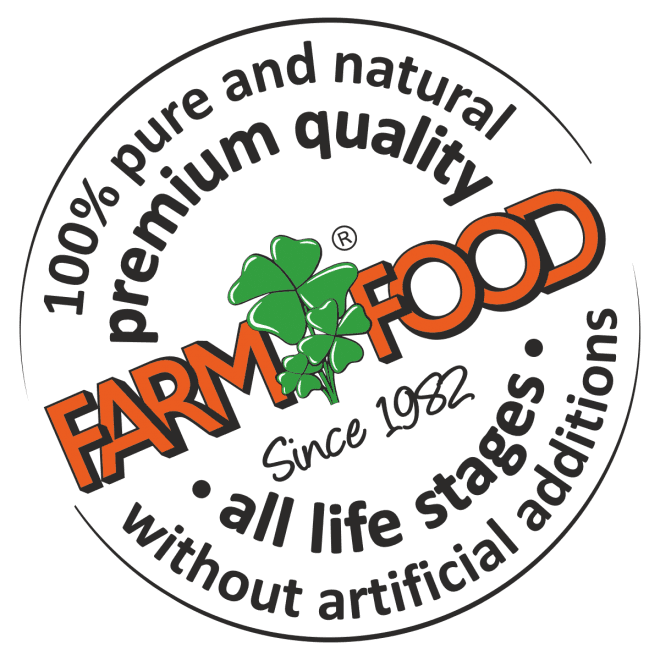 Since 1996, Farm Food has only sold dog chews made from subcutaneous tissue. We do not use any leather hide in the production of our dog chews. We know that, in some countries, a range of different chemicals is used to preserve the hides before they are made into dog dog chews. This kind of preservation is necessary because the hides often spend quite a long time in transit before they reach the production facility. These countries are mostly in the Far East. Several chemicals are also used to remove the hair from the hides. Farm Food does not use any of these chemicals (which, in most cases, are metal salts). We are well aware of the negative effects they can have on dogs’ health. The subcutaneous tissue is delivered fresh to our production facility, which renders the use of such chemicals obsolete. In addition, the subcutaneous tissue has already been removed from the leather hide when it reaches us, so the subcutaneous tissue never comes into contact with the kinds of chemicals used to remove hair from the hides. We regularly test our products for arsenic, lead, cadmium and mercury, among other things. These are the metals that, in general, are most commonly found in the metal salts used for preservation. The same subcutaneous tissue that we use for our dog chews is made up of collagen and is also used in the food service industry to make gelatine. Gelatine has a wide range of applications, including in soft drinks, sweets (wine gums), soups and puddings, but it is also commonly used in the shell capsules around medicines. The latter, in our view, paints a good picture of the quality of the rawhide we work with. If there’s one sector that regulates its ingredients well, it’s the pharmaceutical industry! An article that’s (currently) making the rounds on Facebook refers to hides being bleached with chlorine and hydrogen peroxide. In reality, bleaching hides with hydrogen peroxide would require extremely high concentrations (up to 10%). The subcutaneous tissue that we use for our rawhide has a natural cream-white colour and is not bleached. We do, however, use low concentrations of hydrogen peroxide (less than 3%) to kill any lingering bacteria. This concentration is not hazardous and is washed away with water as part of the production process. During the washing process, the hydrogen peroxide is completely broken down into water (H2O) and oxygen (O2). Our bodies actually even create the same low concentrations of hydrogen peroxide themselves. Subcutaneous tissue retains its cream-white colour throughout the production process. We don’t use dyes to hide imperfections like spots or discolouration. Rawhide is a natural product, which means that sometimes it’s not going to be brilliant white. What you see is what you get. There have also been reports that glue is used in the production of rawhide. We never use glue in our production process. Of course, we can’t speak for other rawhide products. Subcutaneous tissue is self-adhesive, thanks to the drying process and the fact that it’s made of collagen, so it retains its form once it’s dried. Glue is simply not necessary. Our rawhide used to come from South America, but for the last few years we’ve had a production agreement with a Turkish supplier which we visit regularly to guarantee the quality. A lot of dog chews come from Asia (primarily China, Thailand and India). The quality of dog chews produced in these countries often leaves much to be desired and the production process is difficult to monitor. That’s why we stay clear of dog chews made in those countries. One article in particular has been making the Facebook and internet rounds for several years now, and was probably the driver behind a segment run by the Dutch consumer television programme ‘Keuringsdienst van Waarde’ in 2014. Gerrit de Weerd, director and owner of Farm Food, actually made a useful contribution to the programme when approached by the show’s producers. The article we have referred to is clearly displayed in the programme. Below you will find a link to the programme. (The interview with Gerrit de Weerd begins at the 22 minute and 5 second mark). You are certainly aware that quality can vary tremendously when it comes to dog chews that are available on the market today. Unfortunately, all knotted dog chews are often lumped in together as “Rawhide”, which we don’t think is right. We hope this explanation has allayed your concerns somewhat and acted as a counterbalance to the ‘scaremongering’ that’s out there on the internet. Should you have any further questions after reading this, you can, of course, get in touch with us. We will be glad to help you. If you would like to receive this explanation digitally, please contact us. We would be happy to send you the document. The function of good intestinal flora. Why just one food for all dogs? Switching from your present food to Farm Food HE. I am afraid to feed raw meat!